The apartmenthaus international opened in June 2016 and offers 63 high-quality furnished, design apartments in Munich with the highest comfort. Experience the intimacy of a private apartment for a holiday rental in Munich, or also for living in the Bavarian capital for a season. We offer temporary and pleasant short or long stay apartments in Munich, with every comfortable convenience, including weekly cleaning, fitness room, laundry room on each floor, free high-speed wireless internet, two elevators, a dedicated mailbox and bell per apartment, as well as numerous outdoor and underground car parking spaces. 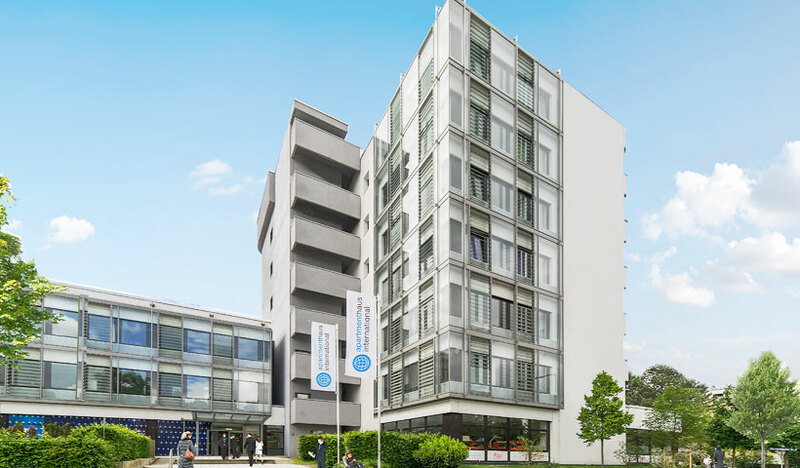 These amenities, together with its great location and beautiful design, make apartmenthaus international one of the top quality accommodations in Munich. All of our apartments have been furnished by our interior designer in a modern, timelessly homelike style. Depending on the room category, the rooms are very bright thanks to large window fronts. They are decorated in pleasant colors and with high-quality materials. Combined with our functional furniture concept, we have created a pleasant atmosphere with enough space for enjoying a long-stay holiday in Munich, or for living and working for a season. Thanks to the excellent traffic connections to the Frankfurter Ring and the public transport system (underground U1/U3) at the nearby shopping mall „Olympiaeinkaufszentrum“ (OEZ)“, the apartmenthaus international can be reached quickly and easily by all means of transport. In and around the OEZ you will find a growing infrastructure with numerous services, doctors, diverse shopping and restaurant facilities and thus practically everything you could possibly need, right at the step of your door. Our Apartmenthaus offers quality accommodation in Munich, and great location so you can enjoy a pleasant and comfortable holiday in the Bavarian capital, with easy access to Munich´s main points of interest like FC Bayern´s Allianz Arena, BMW Museum, Englische Garten, Olympiapark, Oktoberfestwiese or Marienplatz. We would be more than happy to welcome you soon at the apartmenthaus international!